One way pulley for Architrac 93001 curtain rod system. Slides for Architrac curtain rods. Drapery liner byt the yard. Drapery workroom pack, 100 yards. The lining dubbed to bring "Timeless Elegance" brings back the look and feel of sateen drapery lining of years past. Imagine the feel of cotton without the wrinkling and sun degradation problems! It's true 5 harness sateen weave along with a polished calendar finish provides a luster that is not overly offensive or shiny. Often used by quality oriented drapery workrooms exclusively when fabricating custom draperies. The Sonata Sateen provides the perfect answer for decorators, workrooms, etc that are looking for the perfect high quality lining that is "2nd to none" and stands alone top quality, performance, and price. * 50% Polyester/ 50% Cotton * available in White and Ivory * 54" (137 cm) width * Water Repellent * Wrinkle Resistant * High Lustre * Looks and feels like cotton, prefect for lining on a separate track such as under a sheer or behind an open casement fabric. Spring scoket for curtain rodsThis spring scoket can be inserted to a curtain rod end to add a little tension. Plain curtain rod sections can be purchased in 12 foot lengths. This design will not be good for full length curtains, but could hold a small valance in front of your curtain treatment. White finish spring tension adapter for 9001 Turn this curtain rod in to an extra long tension rod, up to 12 feet. Priced by the pair. 9251-025: Curtain rod elbow for 9001 clearance 1 1/2-2"
White finish metal ceiling bracket for 9001 curtain rod. Priced by the pair. Inside mount curtain rod bracket. Curtain tod and traverses rods have a wide variety of installation brackets to fit just about any window. This one is a simple inside mount drop in bracket used for curtain rods with no returns on the ends. It is suitable for solid rods, not the adjustable variety. White finish curtain rod bracket for the Kirsch 9000 drapery rod. Use for inside casing mounting. Priced by the pair. Wood ring for 1 3/8" wood pole, 1 3/4" ID x 2 3/4" OD x 1/2" wide, includes both detachable eyelet and clip. price unit each. Old World elegance that adds warmth and character to modern day interiors. Somerset by Paris Texas Hardware. 3 to 5 days shipping. William bracket for 1 3/8" single wood pole, 1" wide x 3 1/2" high x 5" deep, 3" projection.E price unit each. Old World elegance that adds warmth and character to modern day interiors. Somerset by Paris Texas Hardware. 3 to 5 days shipping. Single and double available. Quick ship program for wood curtain rods. 8 ' Fluted decorative wooden curtain rods, 2 1/4"
8 foot fluted wood pole. Old World elegance that adds warmth and character to modern day interiors. Somerset by Paris Texas Hardware. 3 to 5 days shipping. 214sofl06: 6 ' fluted decorative wooden curtain rods, 2 1/4"
214sofl12: 12 ' fluted decorative wooden curtain rods, 2 1/4"
214sofl04: 4 ' fluted decorative wooden curtain rods, 2 1/4"
Use for corner windows or bay windows. Use this corner connection to give your corner window a decorative look. Adjusts to most angles so it is also an excellent solution for bay windows. Hinged corner elbow for 2 1/4 inch corner curtain rods. 6 7/8 wide by 2 3/4 inches in diameter. Use for connecting bay window curtain rods or corner windows. Renaissance Collection by Design Elements. Renaissance Collection by Design Elements. Priced each. Note: Finial option, not included as you have a wide selection available. Jacobean finial for 2 1/4 inch wood curtain rods. Size is 5 1/2 inches long by 4 inches wide. In stock colors are ready for quick shipment from factory. Renaissance Collection by Design Elements. Priced each. Cafe Rods of all Sizes, decorative and standard! 1 1/2" Elegance Decorative Cafe Rods 84-156"
2-421-8: 1 1/2 elegance 2 decorative cafe rods 28-48"
2-422-8: 1 1/2 elegance 2 decorative cafe rods 48-84"
This traverse rod is packed and sold in bulk quantities for large jobs. Single versions are available that include all the brackets, pulleys and supports. Bulk packages only include the traverse rod. Brackets and supports are available. 0-4009-1: Heavy duty traverse rod 38-66"
Traditional traverse rod tension pulleys. Cord tension pulleys are designed to hold traverse rod cords with spring tension close to the wall. New lock devices are showing up in the market to help with child saftey. These are designed to mount above the tension pulley to hold the cord in a fixed position. Other companies are replacing the tension pulley with a deviceee that will not allow the cord to operate unless it is mounted to the wall. It is very important in any case to mount either device to the wall as it is intended for use to help prevent accidents. 8-658-1: Cord tension pulley height 5 1/2" to 7 1/2"
8-655-1: Cord tension pulley height 5" to 7"
8-6559-1: Cord tension pulley bulk height 5" to 7"
Wall mount bracket for the 3/4" Gifer Contemporary curtain rod. Use with tab top curtains, tie top curtains, eyelet curtains or pinch pleat draperies. Contemporary collection from Gifer. Double curtain rods, traverse rod with valance rod in front. Sheerweave shade fabric sold by the yard. Drapery liner now sold by the yard! Complete motorized drapery traverse rods. Custom made to your size requirements. Ready to install, just plug it in to an AC outlet. Size in Feet --select-- 5 ft. 6 ft. 7 ft. 8 ft. 9 ft. 10 ft. 11 ft. 12 ft. 13 ft. 14 ft. 15 ft. Inches --select-- 0 1 in. 2 in. 3 in. 4 in. 5 in. 6 in. 7 in. 8 in. 9 in. 10 in. 11 in. AC motors for interior window covering products. 504S2 Altus 500 series (110 V AC) torque 35 lb, speed 38 RPM Rapid limit adjustment. Round head. Light duty DC motor for roller shades. LT28 range DC 12V DC tubular motor. Rapid limit adjustment pin mount. Torque 6.6 pounds, speed 34 rpm. About 12" long and 1.22" in diameter.Priced each. Right hand ball bearing master carrier for traverse rod. 50962: Finial scrolled Ball for estate ultra 2" decorative traverse rod. 94129-061: Support bracket for estate ultra 2" decorative traverse rod. 93675: Estate ultra Buckingham assemble set curtain rods wood facials with plain slides. Finial for 2" wooden curtain rods. Finial glass-nickel for estate ultra 2" decorative traverse rod. 1796-061: Ceiling bracket for estate ultra 2" decorative traverse rod. 93670: Estate ultra Buckingham set curtain rods. Facials ring slides. Flat sash curtain rods in wide widths. Use sash curtain rods on doors to keep the curtain panel close to the door surface, top and bottom, preventing it from moving when opening and closing the door. Flat sash curtain rod 48"-86"
6411-025: Flat sash curtain rod 12"-18"
6412-025: Flat sash curtain rod 18"-28"
6413-025: Flat sash curtain rod 28"-48"
Wooden curtain rod poles for your curtains. Wood curtain rods can be used with tab top, eyelet or pinch pleat draperies. Dresses up the window with all the available option like finials, rings and wood brackets. Brackets for valance window treatments. Continental II valance rod brackets. This bracket extends the continental II curtain rod out to clear most treatments. For wide pocket curtains where you have a large job. Available in sku (6605-025) sold in single quantities . 6602r-025: Curtain Rod, 4 1/2" continental extends 18"-28"
6603r-025: 4 1/2" continental Kirsch window curtain rod only 28"-48"
6607r-025: 4 1/2" continental Kirsch window curtain rod only 86"-150"
Traverse rod replacement cord kit. 1-3/8" Cirmosa smooth pole 38-66"
Studio Coordinates Decorative Traverse rods affords a custom look with stock convenience. Choose from a broad selection of lush metal finishes, wood grains and popular paints. Complete the vision with any of the numerous rods, finials and ring slides. Studio Coordinates will be assembled to order and shipped in just seven days from the date of the order. A selection of traverse rods and decorative poles are available even faster. 5686-110: 1-3/8"cirmosa smooth pole 66-120"
Double Traverse rod support bracket. Wide pocket 2 1/2" spring tension curtain rods. You must use proper anchors for the wall material you have to insure a proper installation. Screws only are fine for wood or metal but mollies should used for plaster. Support brackets for traverse rods should be placed every three to four feet of the width. Wall support for 93001 track system. Continuous weighted tape for drapery hems. Add up to 6" clearance to your traverse rods. White finish curtain rod bracket extender. Add up to six inches to clearance. Priced by the pair. For use with the Kirsch Studio Coordinates decorative traverse rods. Metal pendant is more durable than the vinyl slides that come standard in many traverse rods. 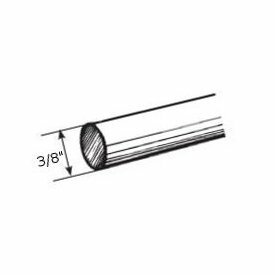 HD27018: Fluted 1 3/8 decorative curtain rod pole only 100"-180"
HD27104P: Decorative traverse rods smooth rod plain slides 38"-66"
Add two inch projection to your current traverse rods with this extender palte. 3980-025: Curtain rod hardware bracket extender 2"
Poly piping for your next sewing project. Different sizes available to do any job. Traverse rod end bracket for double rod installation. 9-128-1: End bracket projects 2-3"
Continental I Kirsch curtain rods 28"-48"
6645-025: Continental I Kirsch curtain rods 48"-86"
6647-025: Continental I Kirsch curtain rods 86"-150"